Innovation, innovation, innovation! There’s hardly a business event or conversation you can have without hearing the term these days. Innovation has been one of the hottest topics of the last couple of decades, and while a lot of people are sick and tired of hearing about it everywhere, the term and the concept behind it are here to stay. We’ve had numerous conversations about managing innovation, and if there’s one thing that’s been quite evident from the beginning, it’s that while there are tons of different concepts and opinions related to the topic, there’s surprisingly little consensus on what effective innovation management really is. As this has proven to be an endless source of debate, we decided to create a series of blog posts covering innovation management to try to demystify and clarify the topic for anyone interested. You are now reading the main article in the series, in which we’re looking to explain the big picture and address all of the most important themes regarding innovation management. 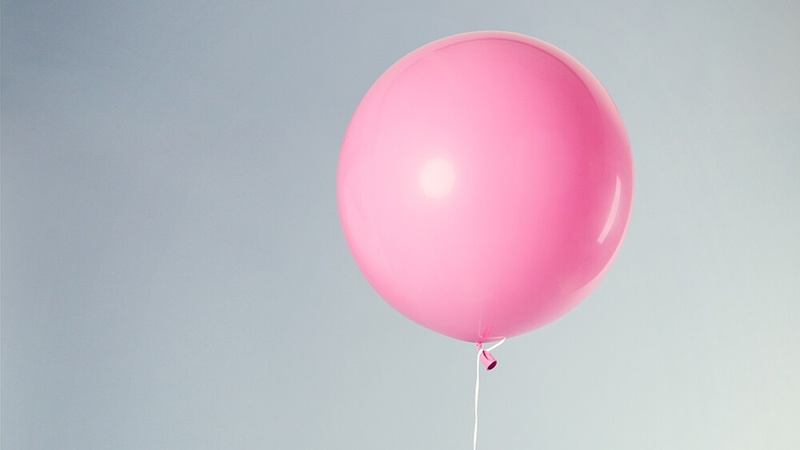 What does successful innovation management look like? KPIs – How to measure innovation? To begin with, we first need to take a look at what innovation management actually is. Innovation management, as a term, is also a source of much debate. Some argue that the very definition of innovation means that it can’t be managed, whereas others are stout believers in building systems and processes for the purpose of creating more innovation. As you can probably guess, the reality isn’t as black and white. So, let’s first take a step back and consider what the term means. The Merriam-Webster dictionary simply refers to innovation as being “the introduction of something new”. This isn’t the same as simply inventing something new, such as a product, as it also needs to be launched and introduced to the world. “Innovation management” thus refers to handling of all the activities needed to “introduce something new”, which in practice means things like coming up with ideas, developing, prioritizing and implementing them, as well as putting them into practice, for example by launching new products, or by introducing new internal processes. By simply looking at the definition, it’s easy to demystify the term. Innovation management is simply the process of coming up with and introducing new things and developing the business, one way or the other. Innovation management is simply the process of coming up with and introducing new things and developing the business, one way or the other. As is evident from the definition, there’s an endless variety of different kinds of innovations. This is the root cause for many of the disagreements related to innovation: people often use the generic term when they really are referring to a small subset of innovation, and even then, strictly from the point-of-view of their own organization and past experience. Before we can delve into the details on the different kinds of innovations, we should first seek to understand the big picture. 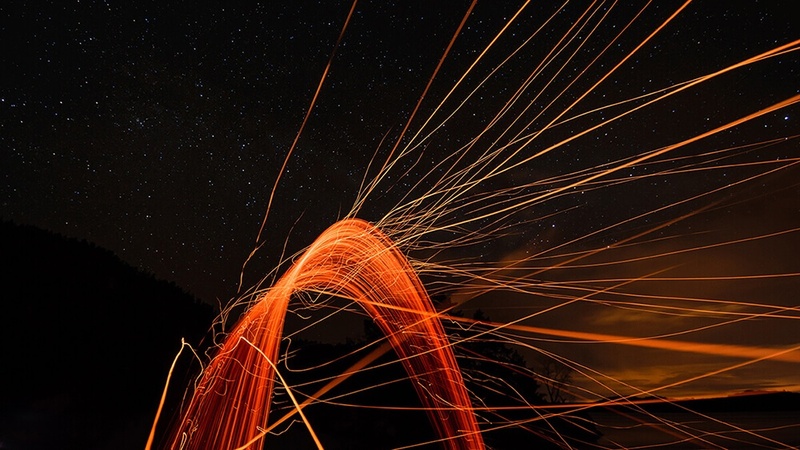 As virtually any new development in the organization can be considered to be related to innovation, it can be quite difficult to grasp what innovation management means in practice. Through our experience in helping organizations with their innovation activities, we’ve found that the simplest way to understand the topic is to break it down and discuss each of the key aspects related to innovation management separately. The diagram below showcases the four aspects that we typically use, each of which we’ll then explain briefly. Capabilities is an umbrella term used to cover the different abilities and resources the organization has for creating and managing innovation. 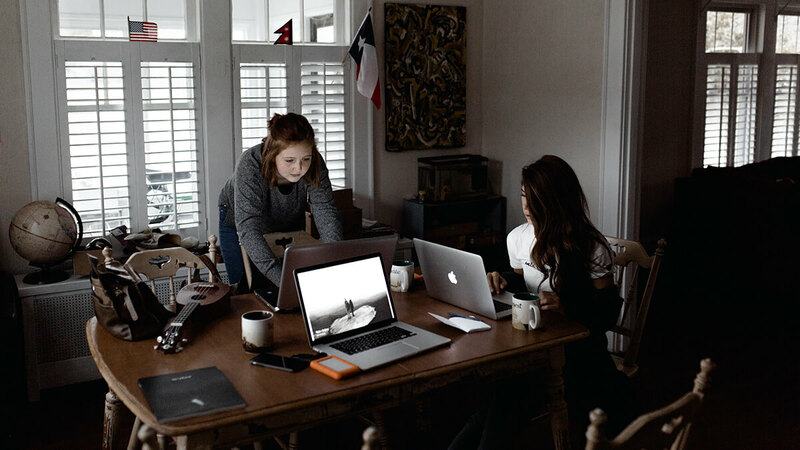 The capabilities aspect revolves primarily around people, as innovation relies heavily on the abilities of both individuals and teams collectively. It refers first and foremost to the abilities, unique insights, know-how and practical skills of the people working for the organization. However, it also covers areas, such as the information capital and tacit knowledge of the organization, as well as their other resources and available financial capital, all of which might be required to create innovation. The difference between structures and capabilities is that structures enable the effective use of the said capabilities. In practice, this means the organizational structure, processes, and infrastructure of the organization. The right structures can work as a force multiplier allowing the organization to operate and innovate much more effectively. For example, without the right communication channels, the right processes for making decisions, and the right infrastructure for implementing ideas, very few of the ideas that people are coming up with will actually see the light of day. This is where tools, such as innovation management software, can make a difference. Without the right communication channels, the right processes for making decisions, and the right infrastructure for implementing ideas, very few of the ideas that people are coming up with will actually see the light of day. Organizational structure is one of the keys here. If every new innovative initiative is forced to go through the same chain-of-command and same processes as minor changes to the existing organization, it’s very likely that many innovations will be smothered. Teams working on innovation need to be able to move fast and adapt to their environment, as well as make decisions independent of the traditional ways of doing things in the organization. So, don’t try to force the same rules and processes for everyone in your organization. Economics of scale simply don’t work when it comes to innovation. One of the more popular approaches for starting to create a more innovative organization is to work towards building a so-called ambidextrous organization. This simply means that the organization is structured in a way that allows new businesses to be independent from the pre-existing ones. Structures can also be used to reinforce (or if done poorly, erode) the culture of the organization, which brings us to our next aspect. 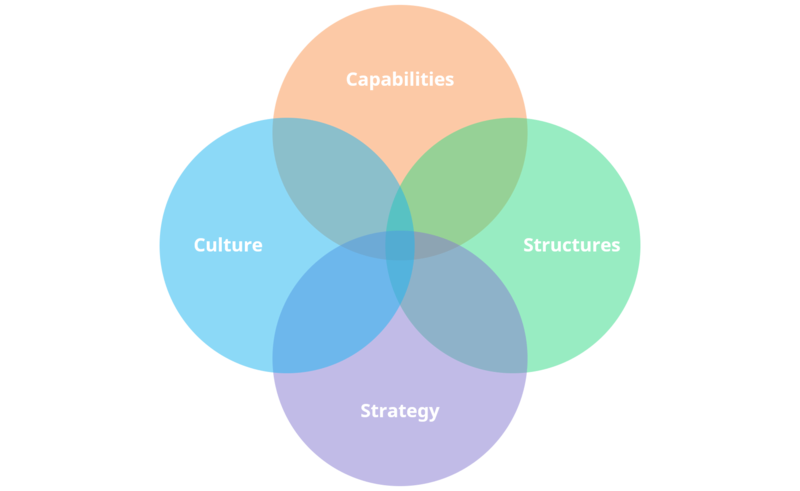 If structures allow the effective use of capabilities, culture is what enables the organization to acquire the capabilities related to people. With the right kind of pro-innovation culture, the organization is much more likely to be able to recruit and keep the right people in the organization. Last but not least, is strategy. Strategy is, simply put, the plan the organization has for achieving long-term success. But what’s critical to understand is that strategy is ultimately about making a deliberate choice between a number of feasible options to have the best chance of “winning” and this choice shouldn’t obviously be separate from the execution. The link between innovation and strategy is quite an extensive topic, but in essence, innovation is simply one of the means to achieving your strategic goals. Innovation is simply one of the means to achieving your strategic goals. There are of course cases where "accidental" innovation can reveal unrivalled opportunities that might be large enough to justify changing your strategy entirely, but these are quite rare and virtually impossible to prepare for. Thus, the key is for your innovation activities to be aligned with your strategy, which however, is often easier said than done. 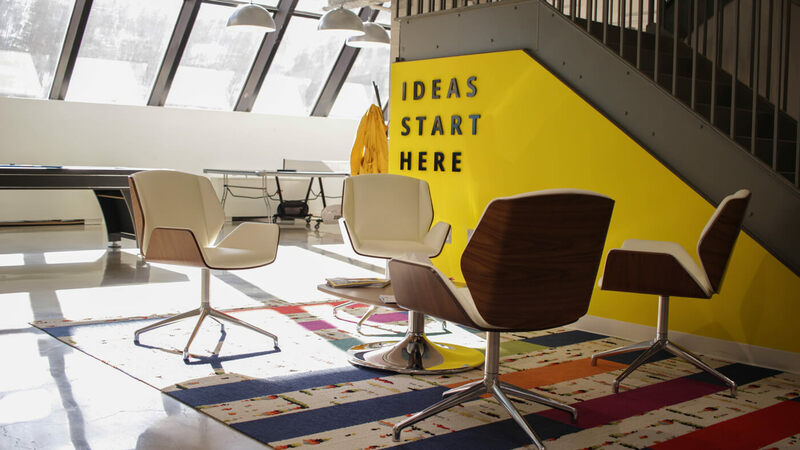 In practice, you need to provide the organization with enough freedom to actually innovate, but also still need to take into account certain practical constraints, such as your strategic focus, available resources and your own capabilities. In practice, you need to provide the organization with enough freedom to actually innovate, but take into account practical constraints too. 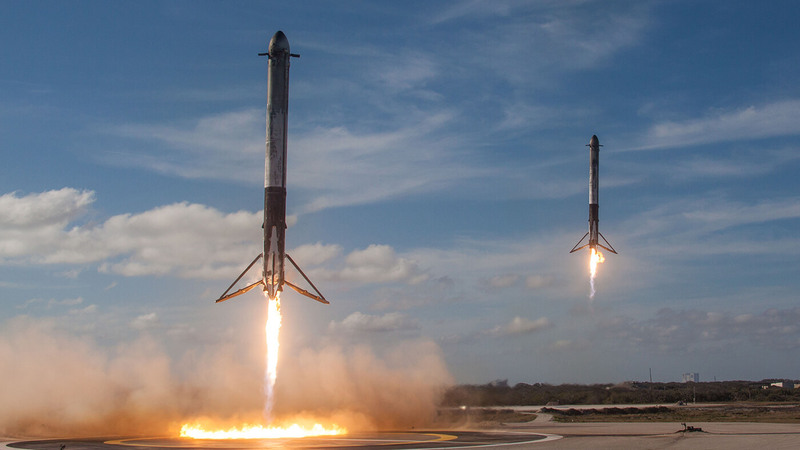 For example, a family business that is focused on catering services, has virtually no cash and only two employees, is quite unlikely to come up new innovations related to rocket technology, whereas SpaceX is much more likely to do so. This is obviously quite an extreme example, but regardless, the point is that it’s the management’s job to steer innovation to areas where it’s more likely to be successful, and likely to be of more use for the organization. All four aspects affect the organization’s ability to innovate and manage innovation, which is exactly why improving it is rarely a straightforward exercise with a simple solution. If you want to be effective at managing innovation, it’s paramount for you to be able to understand both the big picture, as well as the individual components that make it up. 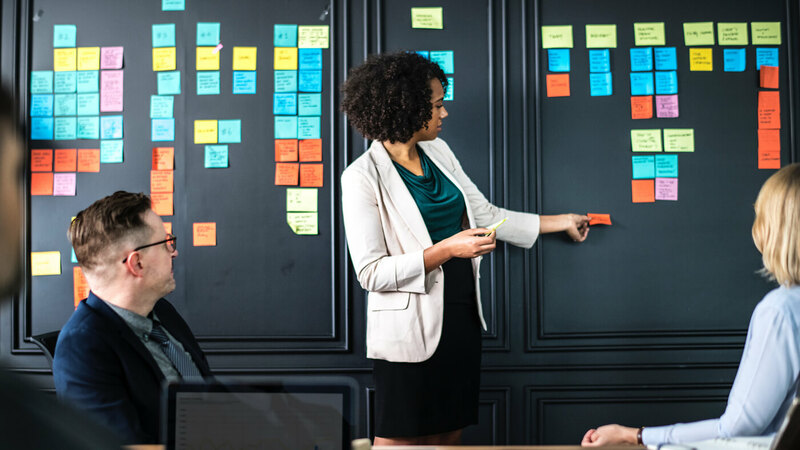 Having established that innovation management is a complex beast, it helps to understand some of the more widely accepted theories, models and concepts related to innovation management. While none of them have the ability to capture the essence of innovation by themselves, they each make an excellent point (or two) about innovation which we can learn from and apply to our thinking. You’ve probably heard people talk about disruptive innovation, incremental innovation, radical innovation and sustaining innovation. These are all terms people use to classify innovation into different types. There are probably as many different typologies as there are authors on the topic since everyone loves to have their own definitions for these terms. This obviously doesn’t help with the confusion. We’ve tried to combine the terms and explain how they relate to each other with our Innovation Matrix. You can use the innovation matrix to clarify the concepts to yourself, as well as to classify the initiatives in your innovation portfolio. 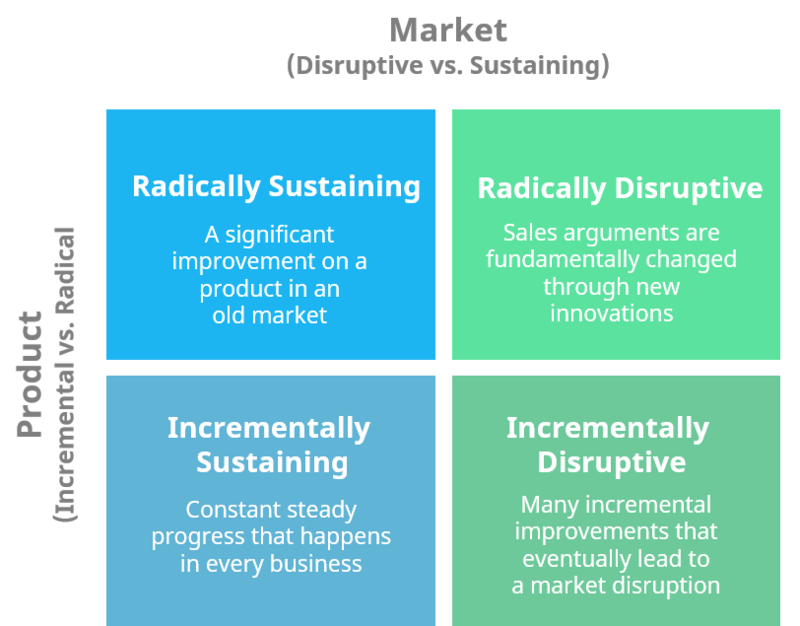 For a more extensive explanation of the matrix and it’s uses, please refer to our post on managing disruptive innovation with the Innovation Matrix. Clayton Christensen introduced this concept in 1997 with his book that bears the same name. The core of the dilemma is that in the beginning innovation, and more specifically the disruptive kind, is usually inferior to existing products and services on the market as measured with the same metrics and value drivers. This, in turn, means that the new products are initially valuable only to a small subset of the market with different value drivers and won’t be of interest for the mainstream or high-end customers, which is where the company typically has higher profit margins. In other words, disruptive innovation initially caters to only a small and not-very-profitable customer base, which is why established companies with rational decision-making processes usually decide not to invest in these disruptive initiatives in the early stages. 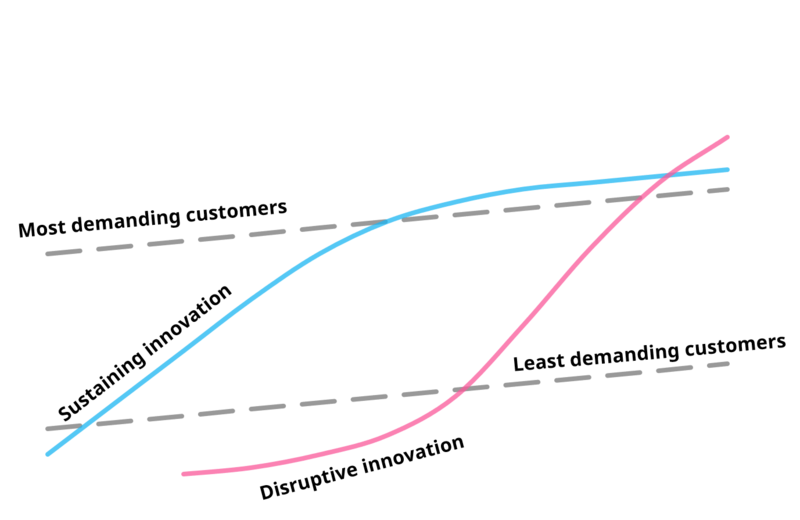 Once the disruptive innovation enters the mainstream, the established companies typically pick up on them again, however at that point it’s often already too late since the new entrant is on the exponential part of the S-curve. This makes catching up quite unlikely, even with the additional resources the incumbent has at their disposal. While not perfect, this dilemma is an important concept to understand if you want to make innovation happen in an established organization. The Technology adoption life cycle was first introduced by Geoffrey Moore in his 1991 book, Crossing the Chasm. It builds on the research on the diffusion of innovations and explains why companies with disruptively innovative products (and/or technology) often have a hard time reaching success with the mainstream market. Other innovators are usually the first ones to adopt new innovations. They want to be the first ones to try new things and are willing to tinker by themselves to make things work. After these initial innovators, there is a slightly larger segment of early adopters who aren’t quite as willing (or able) to tinker but are otherwise almost as eager to get their hands on new technology. Innovators and early adopters are continuously looking for ways to do things better and consider technology and innovations as sources of competitive advantage. As a result, they are often willing to pay a premium for new innovations, even though they might be lacking, or even defective, in certain ways. The majority, however, is much more pragmatic. Even the early majority is much more risk-averse; they are looking for proven solutions at a reasonable price. The chasm, then, is the huge difference between the expectations of the early adopters and the early majority. This is both a product and a marketing issue. However, if you are able to make the leap, you are likely to be able to have a more scalable, and often a more profitable business, as the majority is where the economies of scale start to kick in. This concept is very closely linked to the innovator’s dilemma. For a disruptive innovation to be successful and find ways to take over the mainstream market from the incumbent, they need to figure out ways to cross the chasm. Created by McKinsey & Company, the Three horizons of growth is quite a popular model for helping organizations structure their initiatives and find an appropriate balance between short-term and long-term projects in their portfolio. The basic idea of the model is quite simple: for a company to maximize their growth potential, they need to simultaneously work on projects within all three of the horizons. If you focus solely on incrementally improving your existing business with horizon 1 initiatives, you might see solid short-term increases in your numbers, but will ultimately sacrifice the long-term growth of the company in doing so. The reverse applies if you focus solely on disruptive innovation of horizon 3 and completely neglect your current business. You might have a bright future, but you might be out of business before you ever get there. By finding the right balance, you’ll not only maximize your growth potential, but also decrease the risk of your business portfolio. 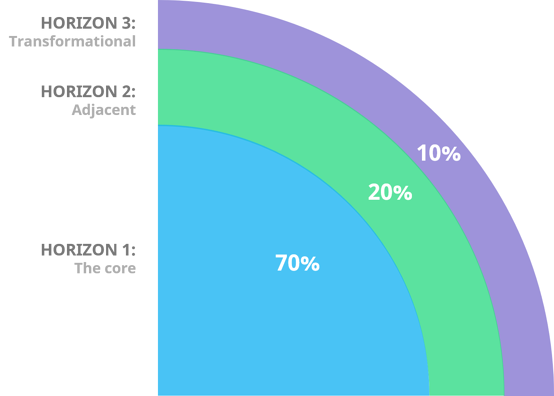 First introduced by then Google CEO Eric Schmidt, the 70-20-10 rule is a simple rule for allocating resources between “the core”, “the adjacent” and “the innovative stuff”, often referred to as “the transformational”. Here, the core refers to all the activities that make up the majority of existing business of the organization, whereas the adjacent simply means new improvements or business areas that are logical extensions for the current business, such as opening new geographical markets for the existing services or products. The transformational, however, is the most difficult one to grasp. That can mean basically anything that is brand new for the organization, such as certain types of innovations. In addition to anecdotal evidence from Google, later research, has also seemed to confirm that companies that allocate their resources in this manner typically outperform their peers by a margin of 10-20% (as measured with their P/E ratio). Their research also identified that the long-term returns for each type of investments are actually the inverse of the resources invested. By now, this might sound eerily familiar since you’ve just read about the three horizons model. They are, in fact, talking about the exact same thing. Thus, we can combine the two for a more practical look at the issue. Having said that, don’t consider the 70-20-10 as the be-all end-all that every business should adopt. Depending on your circumstances and your strategic decisions, a different allocation can definitely prove to be much more suitable for your situation. The 70-20-10 rule is simply a highly practical and reasonable starting point for most organizations. I personally find it quite interesting that in the field of innovation management, there’s quite a lot of talk about portfolio management, but the concept of risk is too often seen as purely a negative issue that one should look to minimize by diversifying the innovation portfolio. While diversifying definitely makes sense in many cases, you should look at risk through a broader lens, especially when it comes to innovation. Risk is the potential of something either gaining or losing value, which means that it simply represents the uncertainty related to that something. In essence, your ability to tolerate risk determines both the potential downside and the potential upside of your investment. As working on innovation always involves a lot of uncertainty, you should look at risk as more than just something to minimize. For example, early-stage startups in general have very little to lose, which is why they’re willing to bet 100% of their resources on working on a single ambitious project with a very high likelihood of failure in the hopes of achieving a large potential upside. If we look at this startup with the 70-20-10 scale, they would be a 0-0-100, which is far from the “ideal”, but is usually the only reasonable approach for such a startup. On the other hand, there are tons of established companies that are highly risk-averse and even though they might have tons of resources, they’re only willing to invest them in initiatives that have a virtually guaranteed return. This obviously caps their ability to grow and generate more profit but does make sense for companies that are primarily interested in providing a steady livelihood for the owners and employees. On the 70-20-10 scale, they would probably be a 95-5-0. Both are perfectly valid approaches, they just cater to the different interests of their owners. The risk of not improving basically means that if you just keep on doing what you’ve always done, it’s just a matter of time before you’ll be out of business. In some industries this might take decades, but in certain fast-moving ones, it might be mere months before you lose your competitive advantage. With software eating the world, this pace is constantly picking up. So, not taking any risks at all can be considered to be the biggest negative risk factor of them all. It has no upside but has a guaranteed long-term negative risk of 100%. These phases cover everything from the innovation starting from a simple idea, to building and bringing it to market, as well as building a business out of it, and then sustaining it for as long as it makes sense. In reality, the length of this timeframe can vary from months to years or even decades, depending on the type of innovation in question. If we again take the early-stage startup from our previous example, let’s call them ACME, they’re probably somewhere between Search and Build. In these phases, ACME is working on a single innovation that is highly transformational, so in other words, their strategy is to go all in with a 0-0-100 approach. 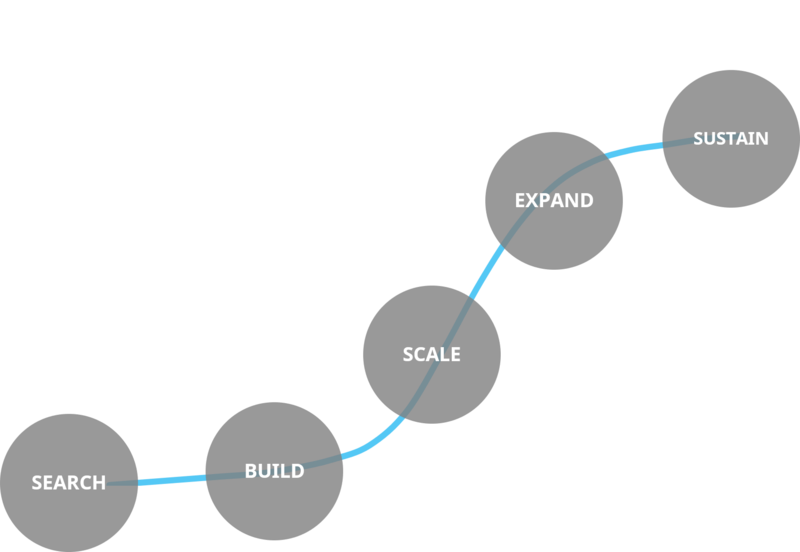 However, once they’ve found a product-market fit for their innovation, they are going to move to the Scale phase. At this point, ACME is still focused on scaling just that one innovation to as wide of a market share as possible. In practice, this means that they’re putting a lot of effort in sales and marketing, as well as on making sure that the product or service keeps getting better and delivering more value for their audience. The focus has now shifted; they’re no longer working on anything new and transformative per se. ACME is now concentrating solely on execution of the business built around their initial innovation since they are committed to getting the most out of the opportunity. We could consider ACME’s focus to now be very much on the core, maybe something like 80-20-0, with the 20% representing things like entering new geographical markets. However, there will come a time when ACME’s innovation is gradually starting to saturate the market, at which point their growth will begin to slow. At this point, ACME is entering the Expand phase, where it’s crucial to still keep developing the core to remain competitive, but to also start looking for adjacent initiatives to keep the growth going. In practice, this could mean an allocation like 65-30-5. 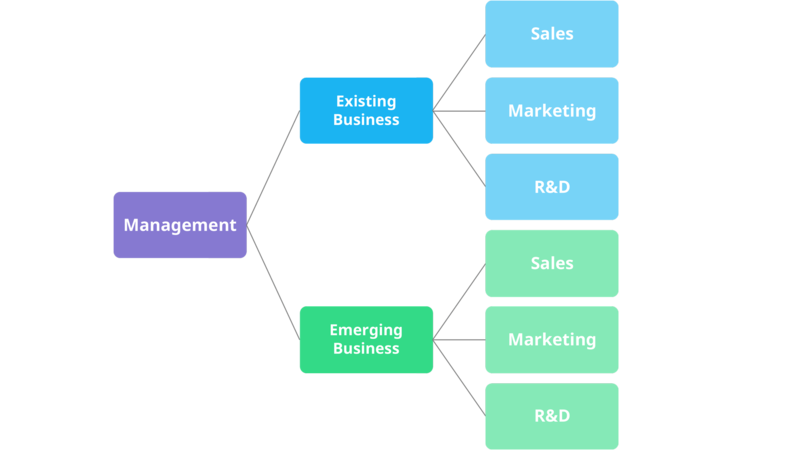 The Sustain phase is where most established businesses usually are. 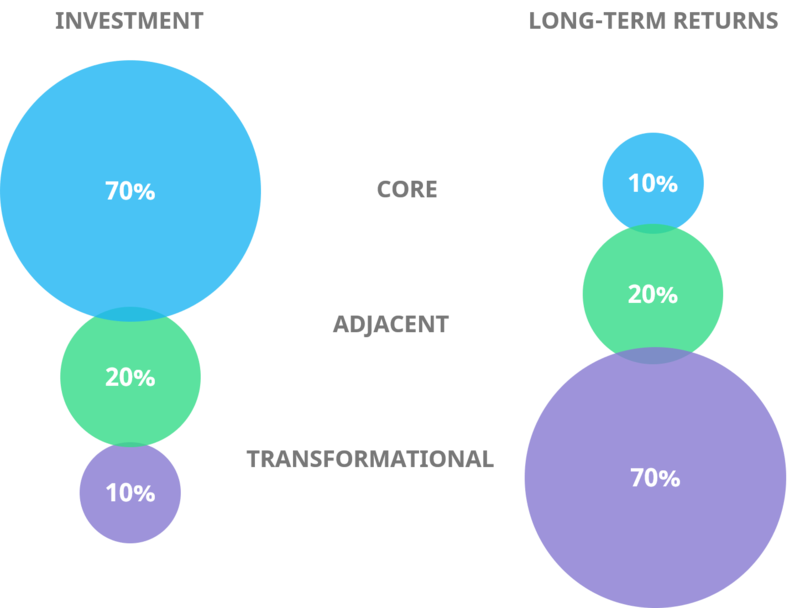 It’s still important to keep developing the core, but for an organization to be able to sustain their growth trajectory, they need to look at more than just adjacent initiatives. At this point, ACME would need to start investing more heavily on transformative initiatives to spark future growth as the lifecycle of this specific innovation has reached its full potential and is now nearing the end of its lifecycle. 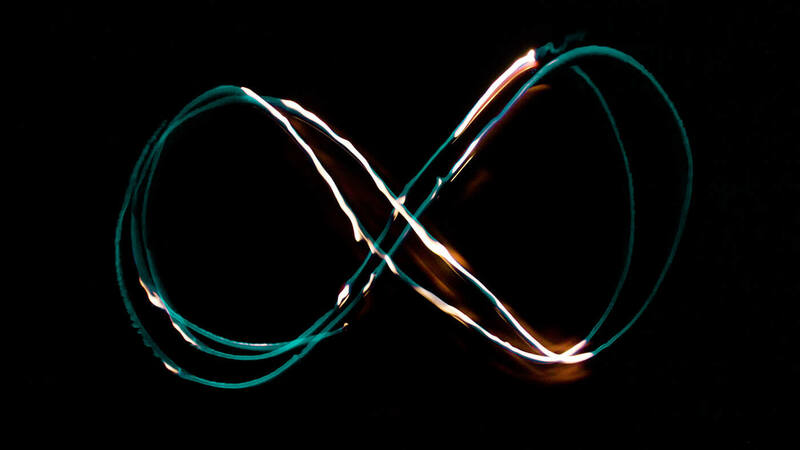 While this is just a fictional example and (for the sake of simplicity) represents a company with a single product, it helps illustrate the lifecycle of an innovation and the practicalities it means for an organization. The different phases of an innovation require not only different skill-sets, but also different viewpoints and approaches to risk. What makes this especially challenging is that approach to risk is often a very personal characteristic that few are willing and able to change. As a leader, you must either be able to realize where you are in this lifecycle and adapt to the situation or relinquish control to others who are better suited for the demands of that specific phase, both in terms of your capabilities, as well as your willingness to take risk. Now that we’ve covered the most important concepts related to innovation, you’d probably like to know what all of this means in practice. What might successful innovation management actually look like? Unfortunately, there’s not a simple right or wrong answer to this question. The right way is always dependent on the unique situation of each organization. However, successful innovation management is usually a result of all 4 aspects of innovation management aligning with each other. With the background that we’ve now established, it probably doesn’t come as a surprise to you that different companies have very different processes for managing innovation, some obviously more successful than others. 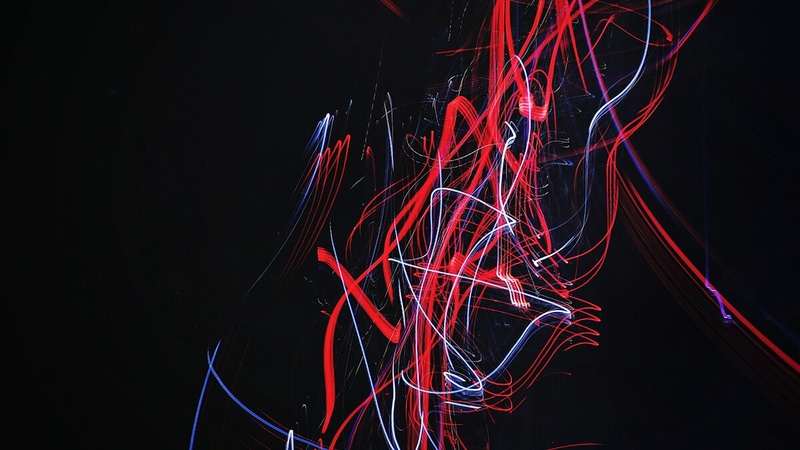 Even when “managing chaos”, most managers that we’ve discussed this with agree that there needs to be at least some structure to innovation work, which is what we’ll refer to as processes here. However, there are a lot of strong opinions related to innovation processes and the discussion often becomes quite polarized with each opposite having firm believers. On one side of the discussion, there are those who very much believe in agile and lean, often pull-based processes, and on the other side of the table, there are those who are stout believers in more rigid and formal, usually push-based processes for managing innovation. We’ve created a simple classification matrix to help clarify the landscape of innovation management processes, which we’ll explain below. The first question is whether the organizations operates on a more push or pull-oriented manner in their innovation work. Push-based models to innovation are more internally and technologically oriented. Push-oriented organizations know (or at least assume to know) the challenges of the market, and the users, and are simply looking for the best ways to address these challenges, usually with new technology. 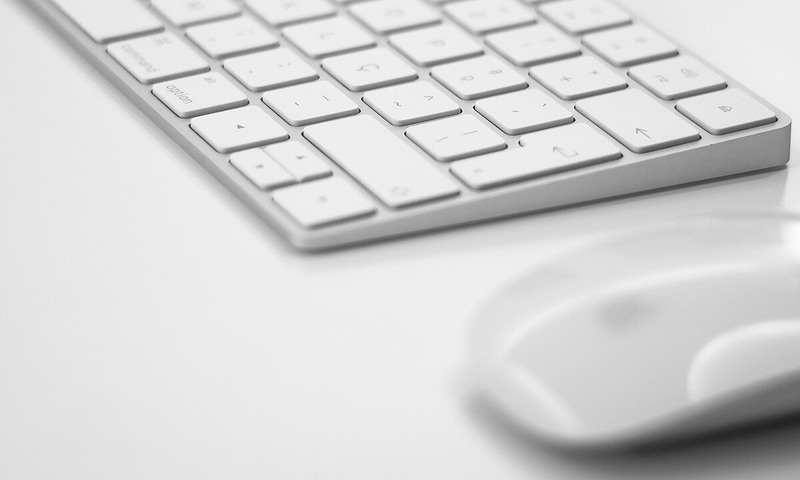 Classic examples of push-based organizations are Apple, IKEA and virtually all pharmaceutical companies. Pull-based models, on the other hand, are more customer and market-oriented. Pull-oriented organizations are looking for ways to adapt to changing markets and customer demand. Thus, they are usually focused more on listening to customers, learning from them and on moving fast. 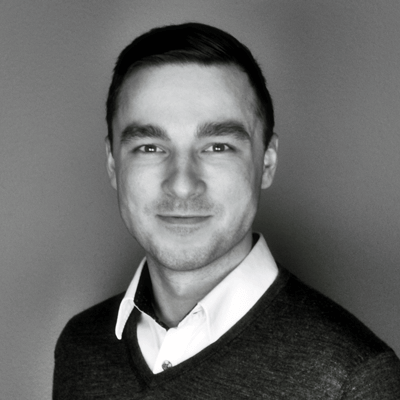 One of the advantages of being pull-based is that it typically requires much less upfront investment than being push-based due to faster time to market and smaller marketing budgets. This, naturally, is one of the key reasons for many startups being pull-based organizations. The Phase-gate (or “Stage-gate”, also known as the “the waterfall” under certain circumstances) process is probably the single most famous process for product innovation with variations of the process having been around since the 1940’s. The model is based on the undeniable fact that there are always more ideas than there are resources. The point is that each idea will have to go through certain pre-determined phases in their development. At the end of each phase, there is a “gate”. When the idea reaches a gate, it will be assessed by using certain pre-determined criteria. If the idea is able to pass the assessment, it will receive additional investment and be able to proceed to the next phase. By standardizing the process that each idea has to pass through and the review criteria that they’ll be measured against, the expectations and decision-making process are going to be very clear for everyone. This process helps eliminate obviously bad ideas and is quite effective at allocating resources to ideas that seem to be progressing well. It helps ensure that every innovation matches the goals and standards of the management. The challenge with this approach is that, by definition, standardization of the phases and the metrics easily leads to only approving similar ideas, often the incremental and easily understandable ones. The phase-gate is a perfect example of a process that can easily lead to the innovator’s dilemma under certain circumstances. By carefully considering the phases of the process and the metrics used for the gates, these challenges can, however, be alleviated. Regardless, this approach often works well in situations where the ideas are similar by nature, the operating environment is highly predictable, and the challenges are more technical in nature. While the phase-gate model is typically used with the traditional waterfall approach, for which it was designed, it can also be used in an iterative manner with agile methods. The majority of processes are somewhere in between these two, so we’ll share another model that many organizations have adopted recently, this one closer to the less formal side of the spectrum, namely the Lean startup. The Lean startup is a methodology for developing products and businesses that focuses on moving quickly and testing assumptions in real life to minimize the risk of building something that doesn’t work or doesn’t match the requirement of the market. 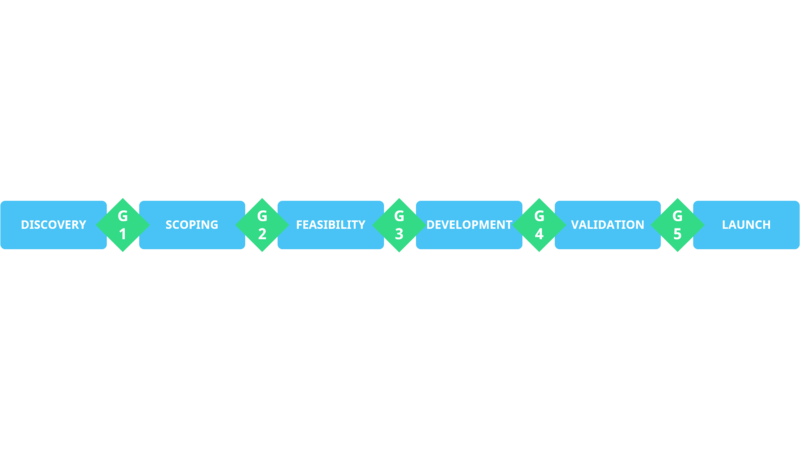 While it usually isn’t specifically labeled as an innovation management process, it is designed to aim for virtually the same goals as, for example, the phase-gate process. It is much more pull-oriented than the phase-gate and is designed specifically to address market risk more than technology risk. 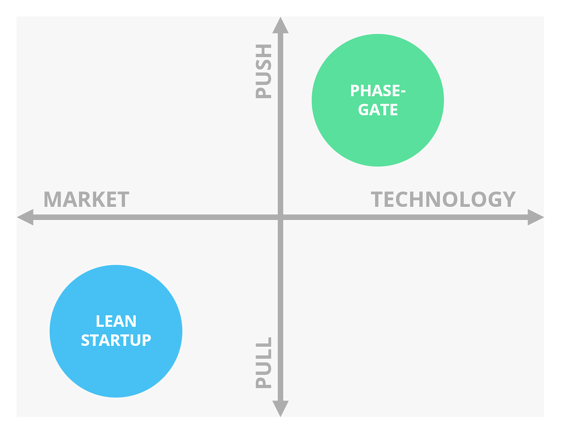 The main idea of the Lean startup model is to rapidly test and validate the assumptions related to the product-market fit between your innovation and your target market in order to learn and adapt as quickly as possible. This obviously makes the approach well suited for organizations operating in an unpredictable, complex or rapidly changing environment, but is perhaps not ideal for the kind of organizations that the phase-gate approach is well suited for, such as those in highly regulated industries like pharmaceuticals. However, if you don’t yet have a very good understanding of what you want to accomplish, for whom and why it would matter to them, the lean startup method is usually a solid candidate for a starting point. The process of figuring out the right innovation management process, or processes, can be a challenging and intimidating effort. As innovation is, by nature, highly unpredictable, the only way to see how a certain process could work for you is to try it out in real life. This is why we recommend you favor the KISS (Keep It Simple Stupid) approach and don’t make things too difficult for yourself in the beginning, unless you already have a clear vision for where you want to start from. If you’re in a larger organization, you’ll almost inevitably need more than just a single process for the different types of innovations in different parts of the organization, so there’s no point in trying to fit everything to a single innovation pipeline. Just start simple in one area of the organization and adapt as you learn how the process works. There’s no point in being concerned about getting everything just right from the beginning as it won’t simply happen. Innovation management processes, however, are a topic that we’re planning to revisit later on, especially as the new ISO 50501 standard for innovation management is currently being developed, so stay tuned. While we have high hopes that the ISO standard could consolidate the terminology in the field, we are also curious to see how the standard will turn out as there’s a certain irony to there being a “standard process for innovation”. 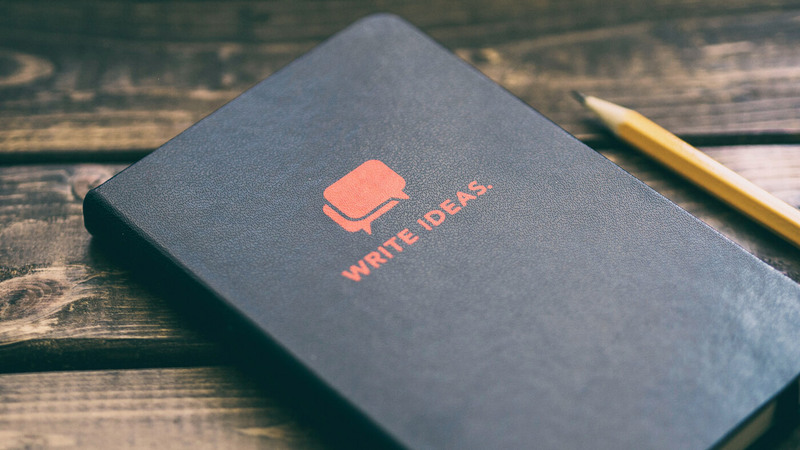 In the meanwhile, if you're looking for practical examples on how to structure the way you collect and develop ideas, I recommend taking a look at our guide to idea management processes. So, while many aspects related to innovation are notoriously difficult to measure, there are a number of metrics, often referred to as KPIs (key performance indicators), that are commonly used to measure innovation activities. However, before we delve into these in more detail, let’s first cover the basics. When it comes to measuring anything abstract and intangible, such as innovation, it’s hard to pinpoint exactly what to measure. As such, we need to take a more systemic approach to measurement and seek to find a set of metrics that are as representative as possible of whatever it is that we’re measuring, in this case innovation. In general, there are two types of metrics that we can use for measuring the system: input and output. Input metrics are, as the name says, used for measuring the inputs a system or activity has. They are the “I in ROI”, in other words, investments. In the context of innovation management, this means metrics, such as the share of R&D or innovation from your total budget, or the number of new ideas submitted by your employees. Input metrics are often a great starting point for measuring innovation as it’s usually quite easy to measure the activities you’re doing. Input metrics allow you to see if you’re doing enough things, and the right things, to be able to achieve results in the first place. They also allow you to see if you’re moving in the direction that you want to, such as by comparing your resource allocation towards the goals you’ve set for your portfolio. For example, by using the three horizons or the 70-20-10 models. They, however, also have their challenges. Most importantly the fact that input doesn’t guarantee output. No matter how much resources you pour in, you might still not see the results you want to if the quality of your activities isn’t right. Another key challenge here is that it isn’t always straightforward to figure out what the right inputs are for getting the best possible outputs, which is especially true for innovation. The other end of the spectrum is output metrics. As you can probably guess, they measure the outputs of your system or your activities. They represent the returns, or the “R in ROI”. Output metrics are a great sanity check for ensuring that your innovation initiatives actually turn into something useful, and again for checking to see if you’re going in the right direction. They aren’t, however, without their own share of challenges. In general, output metrics often aren’t very actionable. For example, it’s quite difficult to know why your revenue numbers for new products aren’t matching your goals just by looking at them. In addition, innovation activities usually take quite a long time to convert to many of the traditional output metrics, such as revenue or profit. This, in turn, lengthens your feedback loop, which means that you might identify problems only when it’s already too late. We usually like to divide innovation metrics into five different categories, each of which can have both input and output metrics. 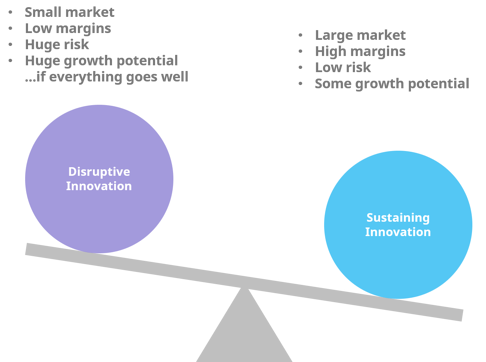 Four of the five categories represent each of the different aspects of innovation management, with the remaining fifth one being focused on business and product related metrics. We won’t go into too much detail on any of these here as you’ll find a number of solid examples in each of the five categories from the infographic above. Every organization is different, so there’s no such things as a universally applicable set of innovation metrics that would work for everyone. Regardless, you get what you measure, in both good and bad, which is why it’s important to choose metrics that best suit your situation. You get what you measure, in good and in bad. For example, if your innovation unit focuses solely on short-term revenue goals and you hold people accountable for those goals, people will find ways to create more revenue. Some of them might just work harder and “do the right thing”, but others will find ways to reach the goals in less beneficial ways, such as by shifting focus towards scaling sales and marketing prior to having a solid product-market fit for their innovation. Innovation is very difficult to get right, and every organization is guaranteed to run into a number of different challenges on their journey to become more innovative. We’ll outline some of the more common challenges below so that you’re aware of them and can start to watch out for them in your organization. In addition, we’ll also briefly discuss certain best practices and key success factors for maximizing your chances of being successful. If an organization has a lot of hierarchy, and the management has a very top-down, often micro-managerial, approach to their job, it is likely to lead to employees at the front lines becoming more passive. You’ll recognize that this is an issue if you hear people say things like “I just work here” and “This isn’t what I get paid for”. Innovation, by definition, is all about exceeding expectations and current limitations. When you hear comments like that, you know that those people will, at best, match the expectations set for them, but never exceed them. And innovation, by definition, is all about exceeding expectations and current limitations. A person has a growth mindset if they think that who they are isn’t just something that’s passed on to them, but is instead something they can work on, for example by acquiring new skills and learning new things. The same goes for an organizational culture. Without a culture that’s growth-oriented, the organization is simply highly unlikely to innovate. Without any processes, resources or infrastructure in place for implementing ideas, it will be difficult for people to achieve impact, even if they wanted to. For example, it’s easy to talk about Google’s 20% time being a great initiative for empowering innovation, but if you were to simply provide the same policy in your organization, it would likely be much less effective. Your employees likely don’t have access to the kind of tools, infrastructure, knowledge or raw data that employees at Google do. As a manager, it’s your job to do the best you can to provide your team with the resources and capabilities they need to be successful and the same most certainly applies for innovation. Great innovations are often born from people having a vision for creating something that doesn’t yet exist, and the same applies for organizations. When your organization has a clear and compelling vision, you are much more likely to attract people who are passionate about your mission and willing to put in the extra effort to actually come up with innovations. However, even if you do think you have a great vision for the organization, you still need to be able to communicate it in a manner that everyone understands and is willing to buy into. Without focus, you are likely to spread your resources too thin and create too much overhead. 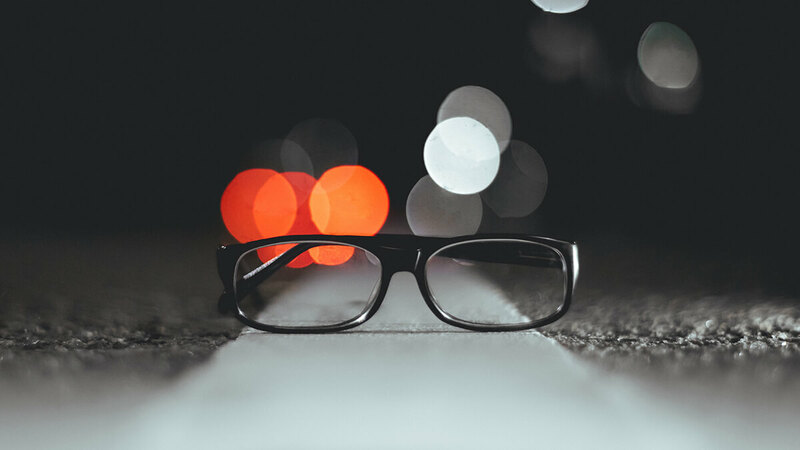 If you have a clear vision and focus, you’ll also be much better equipped for seeing those innovative ideas through to implementation and eventually to successful innovations. Without focus, you are likely to spread your resources too thin and to create too much (cognitive and physical) overhead. This will lead you to be unable to execute on any of the ideas well enough to really be the best at it. In addition, the capabilities that you have are less likely to be in line with those required to actually implement the ideas if the ideas are all over the place. The key success factors and best practices are, for the most part, the opposite of the challenges, and a combination of many of the points we’ve made previously in this post. We’ll summarize the key points here, but for a more extensive take on the topic, please see our post on innovation management best practices. For example, to cultivate a growth mindset, you should have a relentless focus on getting better at all the aspects related to innovation management every day, both as an individual and as an organization. If you improve your infrastructure and processes on a daily basis, you’ll end up with more time to focus on value creation, as opposed to simply working on an endless TO DO list. If you’ve also been working to improve your individual skills during this time, you’ll be much more productive with the time you have, in addition to having more of it. This obviously puts you way ahead in the game by the time that others see the opportunity. A mindset of continuous improvement is also tremendously helpful for cultivating a culture that's focused on getting better and innovating. Many innovators are in the pursuit of chasing their vision, which can sometimes lead them to unfortunately lose sight of the end goal: creating value for your customers. As long as you know your market and your customers like the back of your hands, while continuing to focus on creating as much value for them as possible with your innovation or innovations, you’re likely to go in the right direction. In general, speed is of the essence when it comes to innovation. 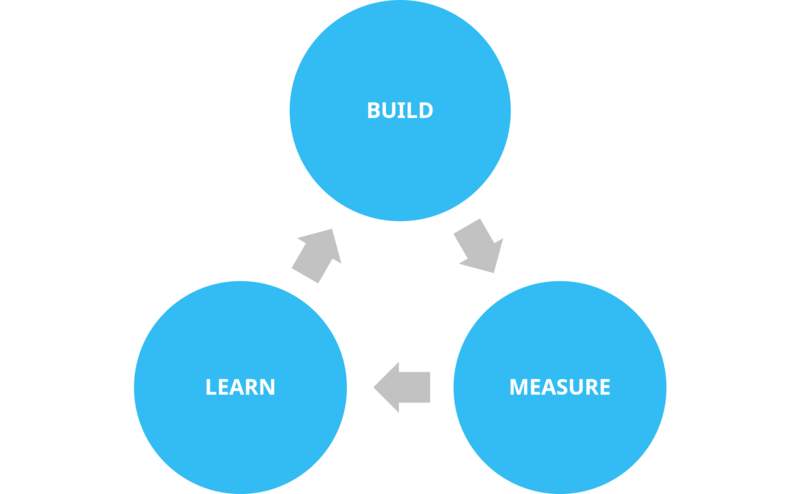 The Lean Startup is a great framework for a number of reasons, but the key reason for its success is the emphasis it has on the velocity of the build-measure-learn feedback loop. Innovation always requires you to learn at least something new, but more often than not, it takes quite a bit of learning. The faster you get there, the more likely you are to succeed. In addition to knowledge, you should always be looking to build your capabilities and the organizational culture to better support innovation. Modern startups aside, let’s consider Thomas Edison and his pursuit for the first commercially feasible light bulb as an example. He went through thousands of combinations of different materials prior to finding the one that works. If he would’ve tried to go through the entire commercialization process for each one of those versions instead of trying to find the ideal combination, he would’ve never made it. He would’ve run out of time and money. Instead, he knew that the critical piece was to find the right material for the filament and he persisted until he did just that. Any organization needs to be clear and purposeful when it comes to resource allocation, but that holds especially true for larger organizations. For an organization to be successful, they should identify their willingness to take risk and their desired level of returns, as well as the timeline for that, and use them to craft a strategy that is not only in line with that background but is also realistic to achieve with the resources available for the organization. Once the strategy is in place, one should continuously seek to monitor progress and make sure that the resources are still appropriately allocated. The days of heroic inventors are, for the most part, behind us. The vast majority of innovation created is these days the result of a team of innovators. Without the right mix of talent, along with the right culture, it’s increasingly difficult for teams to come up with innovations in today’s increasingly complex world. Just like lack of focus can easily be one of the key challenges preventing innovation, remaining focused is one of the key success factors for creating them. You are guaranteed to increase your odds of being successful when you’re focused. The reason for this is that to be better than everyone else and do something that others can’t, you have to be willing to put in the work that others don’t. To do something that others can’t, you have to be willing to put in the work that others don’t. And just like in your personal life, you can’t do that on very many different fronts as an organization, at least not simultaneously. Now that we’ve covered all the most important aspects of innovation management, you might be wondering “where to go from here”. Since innovation management is such a challenging and massive area, there obviously isn’t a specific answer to this question. We usually recommend you start by assessing your current state and then proceed to identifying the apparent bottlenecks in your organization’s innovation work. Some parts of the different aspects, such as certain processes, might be easier to fix than other aspects like culture, which will without a doubt take more time. 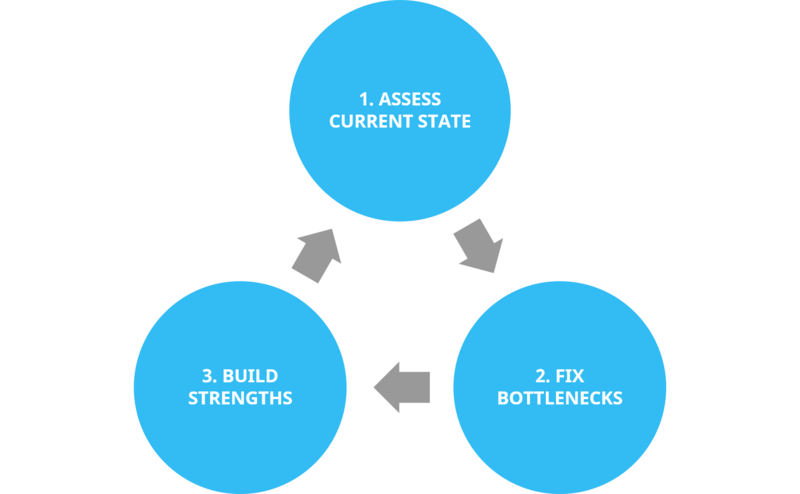 Once you’ve fixed the bottlenecks, it’s then time to start focusing on building your capabilities in all four of the different key aspects we introduced in the beginning of this post. While it’s important to fix any obvious bottlenecks you might have, don’t use all of your time to simply work on weaknesses. Innovations are born from being exceptional and different at something, as opposed to being average at everything. Once you’re the best in the world in whatever your domain is, and you’re still hungry to improve and get better, innovation will inevitably follow. This obviously takes time, so you’ll need to take it step by step. And remember that just like successful strategy work, innovation is all about the execution. 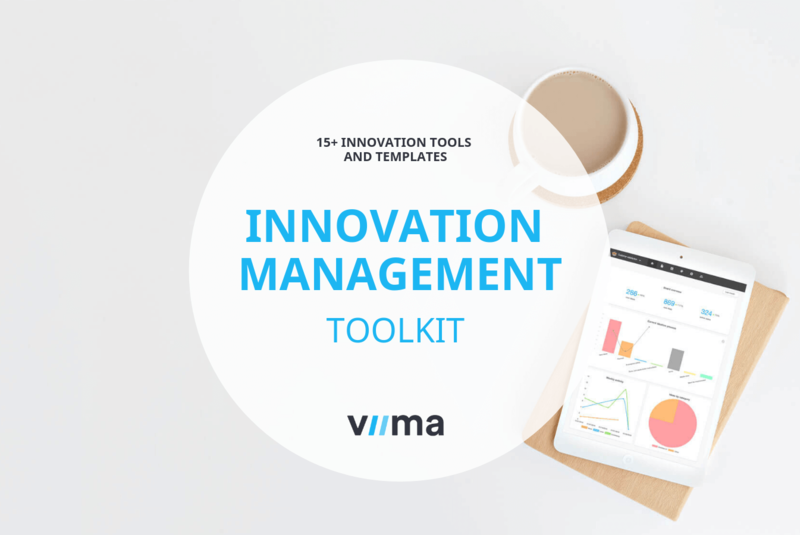 To help you get started, we've created The Ultimate Toolkit for Innovation Management that consists over 15 of our favorite tools, templates and guides for managing innovation. This comprehensive toolkit can help plan your strategy, build processes and make more innovation happen in your organization. 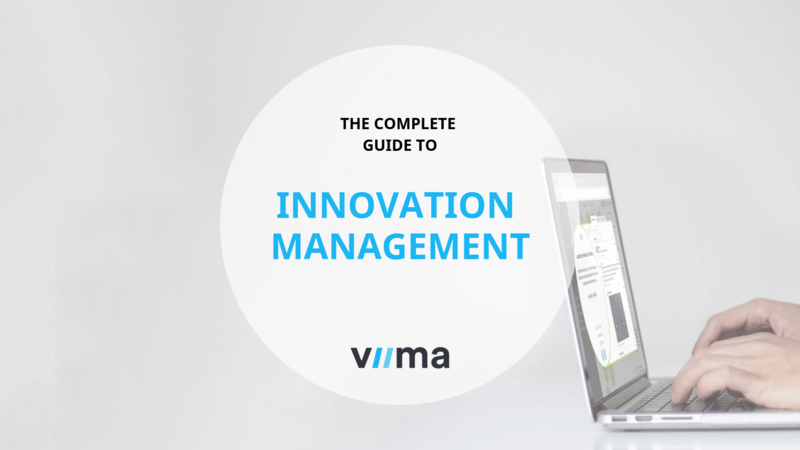 This article is meant to be the definitive source of information regarding innovation management, so if you think something’s missing from the article, please let us know! Also, don’t forget to subscribe to receive updates for more of our upcoming content!